The global teleradiology market is anticipated to be highly fragmented owing to the presence of various players in the global and regional market, both. Currently, the market seems to be much consolidated because of the soaring demands for radiologists all over the world, along with the rising popularity of advanced internet services and improved healthcare informatics. Some of the key players in the global teleradiology market are Siemens Healthcare, vRad, Agfa HealthCare, and StatRad. The players in the market are focusing on research and development activities in order to provide better services at low costs. According to Transparency Market Research the market is expected to flourish with a notable CAGR of 18.5% within the forecast period from 2015 to 2023. Other important vendors in the teleradiology market are Cybernet Medical, Argus Radiology, Everlight Radiology, Fujifilm Medical Systems, Franklin and Seidelmann, GE Healthcare, Merge Healthcare, Medica Reporting, NightHawk Radiology, Philips Medical Systems, ONRAD, Radiology Reporting Online (RRO), RamSoft, Radisphere National Radiology Group, Sectra Imtec, Telemedicine Clinic, TeleDiagnosys Services, and Teleradiology Solutions. Rise in number of processes, high awareness as it is a conventional strategy, and minimal effort when contrasted with different modalities are the key drivers of the X-beam teleradiology segment. 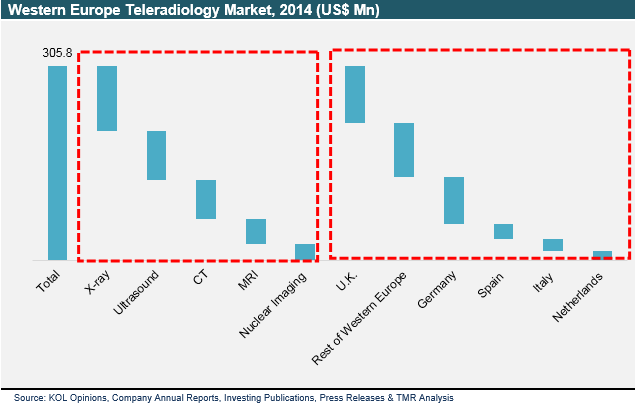 Nonetheless, computed tomography teleradiology seems to be the most lucrative section of the teleradiology market in Western Europe. Capacity of the mentioned tomography to give 3-D images of body parts, for example, lungs, brain, heart, and abdomen; precision in analysis, and consistent improvement in the innovation are foreseen to make it the most lucrative segment of the teleradiology market in Western Europe during 2015 to 2023. Nevertheless, in-depth and complex images of computed tomography are hard to figure, and subsequently require a specialist radiologist. Resultantly, demand for teleradiology is foreseen to rise notably during a forecast period. Ultrasound teleradiology represented the second biggest share of the teleradiology market back in year 2014, as it is a first-line methodology in the analysis of a few stomach issue and during pregnancy. Moreover, nonappearance of ionizing radiation and low cost makes it a more favored methodology to ultrasound. Be that as it may, multifaceted nature of 3-D and 4-D pictures require experienced radiologists. This further expands the demand of teleradiology. This surges the demand for teleradiology in cases of emergency or for second assessment. Also, individuals prefer taking second opinion from expert radiologists. Moreover, absence of advanced image transfer innovation in rural zones, complex cross-border controls, high initial capital, and lingual contrasts that prompt confusion could limit the development of the teleradiology market in Western Europe during the period from 2015 to 2023. In-depth and complex images of computed tomography are hard to figure, and subsequently require a specialist radiologist. Resultantly, demand for teleradiology is foreseen to rise notably during a forecast period. Minimal effort when contrasted with different modalities is the key driver of the teleradiology market.